Everyone knows the renowned TV actress “Mandira Bedi”. She is an Indian actress, fashion designer as well as a television presenter. She famous from 1994, she was playing the role of Shanti and that telecast on Doordarshan. She is 46 years old but maintained the body after marriage. Mandira Bedi lifestyle and fitness are superb. She lost 22kg by maintaining a proper lifestyle and regular exercise. Now come to the point that Mandira Bedi comes back on silver screen with Bahubali fame ‘Prabhas’. The film will be ‘Saaho’. Actually, she is very active on TV. Sometimes you can see in an advertisement, can host the channel programme too. Nobody thinks that a simple living girl will be signed the film with “Prabhas’. The role offered by the director is very important. You can say that is the lead role, which she will play. Mandira will play a negative character in this film. But already Mandira has played a lead role in 1994 hit show ‘Shanti’, So she will not face any problem. This is a great challenge for him. 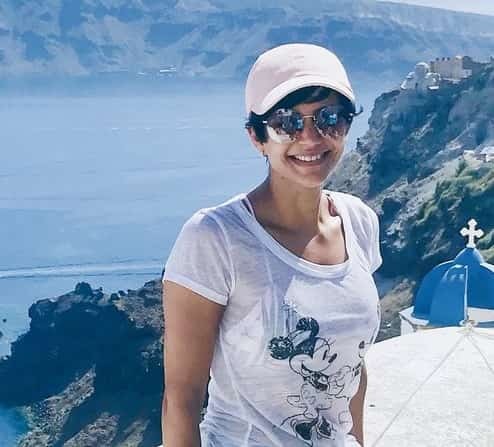 Actress Mandira Bedi is giving the credit to her short hair to get the role in film Saaho. She clarifies and asked why if anybody keep the short hair, will not a perfect mother and wife. Today the director signed me for the film due to my short hair and said that viewers will accept you with this look. Another reason is that she was very active in web series and short film. Her short film ‘The Gift’ was very famous with Gul Panag. Accept all this she worked in TV series 24 and viewers liked that. Mandira Bedi is fit, So she is hit. She exercises every day approximately 1hr 20minuts. That is the basic reason for fitness.